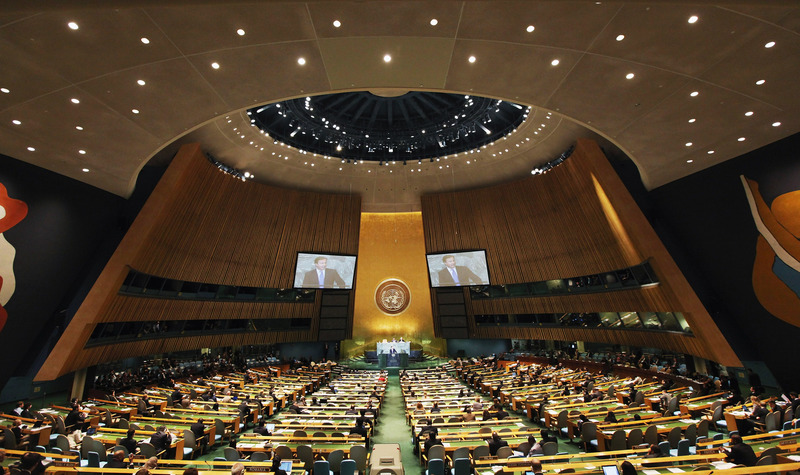 If there's anywhere you really just don't expect models to be strutting down a runway in, it's probably the United Nations debate chambers. But, this is fashion we're talking about, and generally speaking, if you think you've seen it all when it comes to models/designers/style, you probably haven't. It's hard to tell exactly what the thought process was behind the choice, but Ambassador Riyad Mansour, head of the Palestinian observer mission to the U.N., played host to the fashion show—although it wasn't an entirely peaceful event. Described by CNN as a "cultural event," the runway show featured Taslaq's fall/winter collection, consisting of 30 pieces ranging from gowns to suits. Taslaq said his designs were inspired by Palestine directly—with many of the materials, designs, or manufacturing having direct connections to his home country. Taslaq said that he thinks that fashion is an opportunity to provide a creative outlet capable send a powerful message. "I think fashion, like music, doesn't need the language. All the world can hear and watch the fashion," Taslaq told CNN. "And this is a message for all the world." However, not all U.N. ambassadors were pleased with the event. The show was specifically criticized by Israeli ambassador to the UN, Ron Prosor, who had harsh words for the Palestinian officials regarding both the fashion show and current Israeli-Palestinian conflicts. "The Palestinian delegation is off to a fashion show, because, after all, they are experts in dressing up and disguising the truth every day," Prosor told CNN. However, both Mansour and designer Taslaq said that they viewed the show as an opportunity to promote Palestinian culture, and ultimately, the idea of peace. Mansour also noted that the idea that Palestinians "cannot be a part of humanity to share the rest of humanity and the rest of the international community our creativity in the field of fashion" is racist in nature, referring to Prosor's comments regarding the fashion show. Controversy aside, designer Taslaq emphasized that the connection with his home country is what inspired him to create this collection. He described his work as showing "another face of Palestine," and noted that when he left the country after his schooling, he knew he had to create something representative of Palestine. "When I left Palestine I understood that I must do something for me and my people to show the world that we are the same as other people. We want a life. We want peace. We love. We have all the feelings that make us the same as other people,” Taslaq said.